I didn't ever expect to enjoy a novel whose title began with the words, "Daughter of the...". Those of you who have been reading YA for long enough know that these titles had their phase and I truly believe that ship had sailed. But, Levenseller's debut, despite its title hearkening to previous YA literature, is wholly unique. 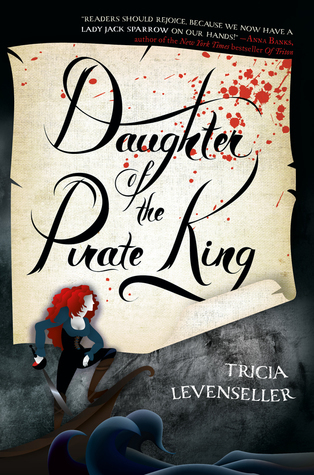 Daughter of the Pirate King introduces many tropes we're familiar with, from a beautiful and headstrong protagonist to a cocky, utterly charming love interest but Levenseller spins it into a tale I just couldn't put down. This story is just pure fun and I read it in a single sitting. Alosa is fiery and smart, a combination I love, and her banter/love-hate relationship with Riden is at the core of this novel. The plot is fast-paced, swiftly making us support Alosa in all her endeavors, from making Riden believe she wants to escape the ship to her stubborn refusal to help the crew, to her ingenious plans to escape her cell. But, the heart of the story lies in her evolving relationship with Riden. Their friendship reveals so much about their pasts and the plot twists are a pleasant surprise. I, especially, love that their romance is drama-free and constantly keeps the reader on their toes. I wish I had liked this more. I found Alosa quite annoying - she was just too cocky - and the romance felt very forced to me. I won't read the sequel but I hope you enjoy it, Keertana! I think I can deal with those niggles. I've been curious about this one but I do think I will have to make sure the library carries this one. Brilly review!! I adored this book! Honestly I thought it was MG so I almost skipped it - so glad Macmillan sent it and I picked it up one evening. Riden and Alosa! Faves! I hope there are many more scenes featuring the two of them, in book two. Book two is entirely too far away! So many people have either loved this or hated it. I think I would really like it. I definitely need to add it to my ever growing TBR pile. Wonderful review. I only picked it up because it saw it everywhere. And it was definitely enjoyable. Not amazing, but I will read the next one as I'm curious. I had to keep reminding myself that it was for YA, and middle aged YA at that, and not written for adults. Hence why the story was simple sometimes. But I still had a fun time reading it. I do agree that the plotline was fairly simple but at the same time dang near impossible to sit down! In my review I stated how I loved Alosa's character the most and the hate to love with Ridden is very sweet.